Now I’m using XP Pro instead of the desired Windows 7 beta, I can now see the boot camp partition. It’s a weird behaviour because my keyboard’s Alt key (Option for Leopard) doesn’t work anymore. It worked once when I switched from Windows 7 to Leopard but not in the reverse direction. There is a very nice walk-through here but I can’t see other people having similar problem like mine. My problem, which is that the boot camp partition installed with Windows 7 has gone missing, appears to be a known issue after my search in the forum see here, here and there. May be I’ll try again when Windows 7 RC is in the wild. I can’t understand why Mini scored less than my DIY desktop because Mini is having DDR3 1066MHz memory. It would be even better if Apple has another version using 7,200 rpm hard disk. It should have been a DOA item if I hadn’t registered online, never mind it’s near new with the drive replaced. The first day of the holiday we found flat battery on our 4 months old new car. Douglas must have been naughty in flipping a switch that turned on all the interior lights. Luckily that didn’t cost me anything to have it fixed. 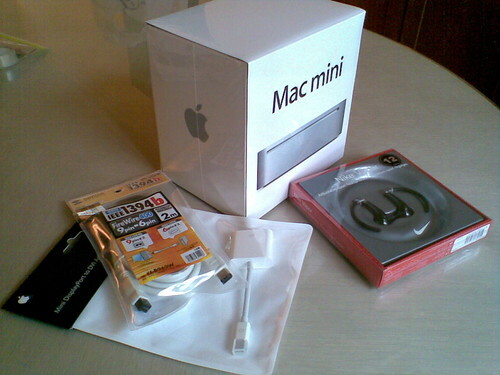 Last Thursday I bought Mac Mini in Central since I’ll be selling my near 2 years old MacBook. During the holiday I must have installed OS X 3 times. During first installation I couldn’t resist the temptation of restoring from my time machine backup of my MacBook which was the easiest. Getting online to update the system was the first thing I did but I found problem connecting using my mobile broadband account and authorizing Mac Mini to sync with my iPod Touch. During the second installation I found Mobile Connect again crashed the OS on loading. I think what I did wrong was that on successful installation of the MobileConnect I don’t have to launch this application because the driver should have been installed and I just need to create a profile and enter the phone number in system reference>network>HUAWEI Mobile. Restoring from my MacBook time machine backup may be a bad idea so on third trial I tried fresh installation. Too bad this time my iTunes library backup dated 8 April 2009 didn’t work, I had to use an older one dated 8 August 2008. The first DVD out of 4 can’t be read?!!! The DVD drive was giving noise like a diesel engine but the cooling fan was only running at ~1,500 rpm. Obviously the holiday was too long so more problems found. The DVD drive is extremely noisy and data transfer rate was extremely slow. It wasn’t bad DVD that I burnt the bundled software DVD that came with box also gave that noise, see below. The above screenshot was taken at the shop when I returned the unit for their checking. 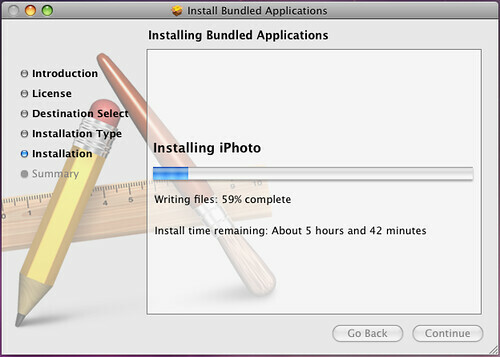 Earlier I saw “…time remaining: 8 hours 2 minutes….” which was pretty scary when I installed those bundled software for the second time. So I thought who cares I could get an exchange if I returned it within first 7 days but to my disappointment they can’t do that because I have already registered online this Mac Mini.